Wrap Detailer cleans and protects glossy vinyl wraps, shiny printed graphics, and clear bra protection films on all vehicles. Wrap Detailer cleans and protects glossy vinyl wraps, shiny printed graphics, and clear bra protection films on all vehicles. The synthetic detailer safely removes dirt, dust, road grime, and bird droppings without causing any scratches or swirls on the surface. Wrap Detailer is blended with spray sealant technology to protect shiny vinyl wraps and graphics on all vehicles. UV solar blockers prevent vinyl wraps and graphic designs from fading, and help prevent yellowing and discoloration on clear bras. Harsh weather conditions can cause premature wear on all stick-on wraps and graphics. The sprayable detailer conditions and protects the surface to prolong the life of vinyl car wraps, clear protection films, and printed graphic kits. Wrap Detailer safely removes dirt and debris from custom wraps and graphics without causing swirls or scratches. Custom vehicle wraps are sensitive surfaces that require special care and attention. UV solar rays, water spots, road grime, and contamination can stain and ruin wrapped surfaces. 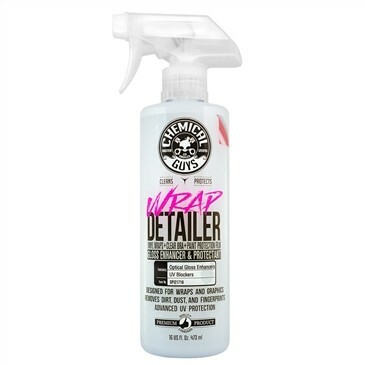 Wrap Detailer is designed to maintain and condition the surfaces while protecting vinyl wraps and graphic kits from stains, swirl marks, and aging. Simply spray and wipe dirt away for a brilliant shine. Works great on OEM and aftermarket vinyl graphics on all vehicles. Wrap Detailer is the perfect choice to clean, shine, and protect all vinyl wrapped surfaces and graphics.Wrap Detailer is designed to clean, shine, and protect glossy vinyl wraps, clear bras, and printed graphics. Vinyl wraps are the newest trend to completely transform the appearance of any vehicle. Simply wrapping a vehicle in a custom color can instantly change the appearance and style, while clear protection films shield paintwork from rock chips and hard insect splatters. Custom wraps and graphics look great at first, but harsh weather and driving conditions can destroy their appearance over time. Without proper care, vinyl wraps and clear bras will stain and discolor, and make the vehicle appear neglected. Vinyl wraps and graphics require special detailing products to maintain and protect their appearance over time. Wrap Detailer is designed to protect and maintain custom clear bras, vinyl wraps, and graphics. The advanced synthetic detailer is formulated to clean, shine, and protect vinyl wraps for a fresh look over the life of the covering. The innovative Wrap Detailer easily cleans away dirt, dust, road grime, bird droppings, road tar, and light stains that accumulate while driving on the road. The sprayable detailer safely lifts dirt and debris off vinyl wrapped surfaces without causing swirls or scratches. Wrap Detailer is perfect for cleaning and protecting OEM and aftermarket films, wraps, and graphics on all vehicles. Regular maintenance with Chemical Guys Wrap Detailer will make any wrap a show winner!